Confession: I’m no neatnik. Oh, you guessed as much? Dang. I apparently posted one too many photographs exposing my penchant for clutter and collecting. Now that things are out in the open (piled, stacked, strewn and amassed in the open) I will share with you my recent effort to restore order to the porch. Once used to board seasonal farm workers, the enclosed porch now hosts more sedentary guests like old tax returns, boxes, filing cabinets and tattered books. 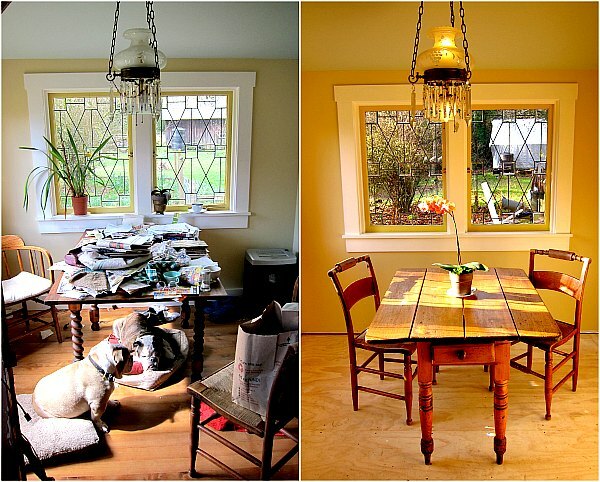 Two years ago, I remodeled my breakfast nook from the worst room in the house to one of the best. With help from my friend Jon, we upgraded the walls, floor, ceiling and window casements, creating a dreamy garden-room nook with four lead-came windows framing the garden, capturing the light, and welcoming the visitor and host alike. In the winter months and on rainy days, the room is my refuge. Each morning, I brew a pot of coffee, turn on the laptop, feed Boz and wait for Gracie and daylight to enter the room. Trouble was, as a dual purpose dining nook and office, the space suffered from a split personality. Stacked plates on stacked seed catalogs were just waiting for gravity’s pull to topple the tower onto a laptop keyboard below. When friends would drop by, I’d push the clutter around to expose a landing spot for their coffee cup. Finally I had had enough. It was time to move my office upstairs, and save the nook for coffee breaks, dinner time and begging bulldogs. I was up to the challenge of boxing up books, removing clutter, and prepping for paint. I decided to paint the walls a warm white, and the ceiling a brash blue, the kind you see on an unapologetically bright sunny summer day. I completed my day-at-the-beach look with floor paint stealing its color from beach sand, South Carolina beach sand. 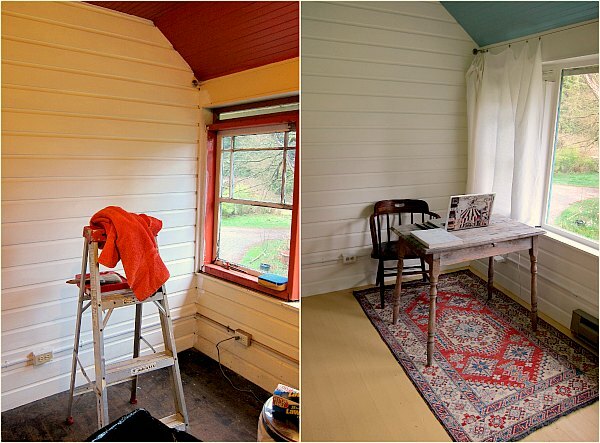 It’s amazing what fresh paint can do to a room and your outlook. Goal one: creating a room I want to work in. 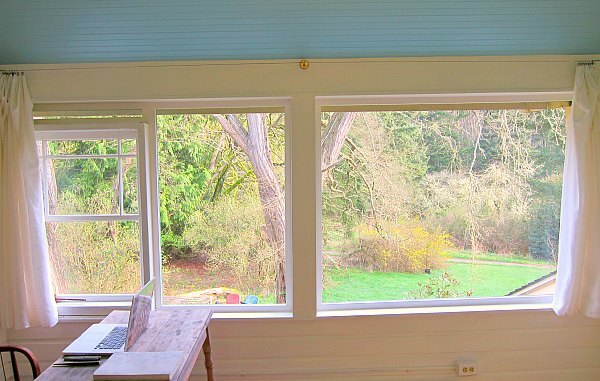 Facing north, my new office is a clean workspace with inviting light and a bucolic view. I’m getting used to the small table and limited storage space, keeping what’s good, and eliminating the bad and the ugly, all while embracing my new mantra (at least for this room) that less is more. And while I’m pleased with my room makeover, there still is one problem. What do I do with all the stuff that came out of the room and is now in my hallway, bedroom and guest room? Ah, baby steps, Tom, baby steps. Tom, your home is looking very cozy and tidy. I can understand all about the “stuff” sitting elsewhere now. Just take a strong cup of coffee, drink it down and start tossing. It really works. Good advice Susan. Okay I got the coffee part, now working on tossing, or rather thinking about tossing. Hmmm, let me sleep on that. Maybe it is time to invite your Mom and sister to come help motivate you;-) The did a good job on the barn and the pantry. I can see a trip to Grannie’s in your future! Yep I need to donate a truckload of stuff! Tom, your new office looks great and the dining nook also. 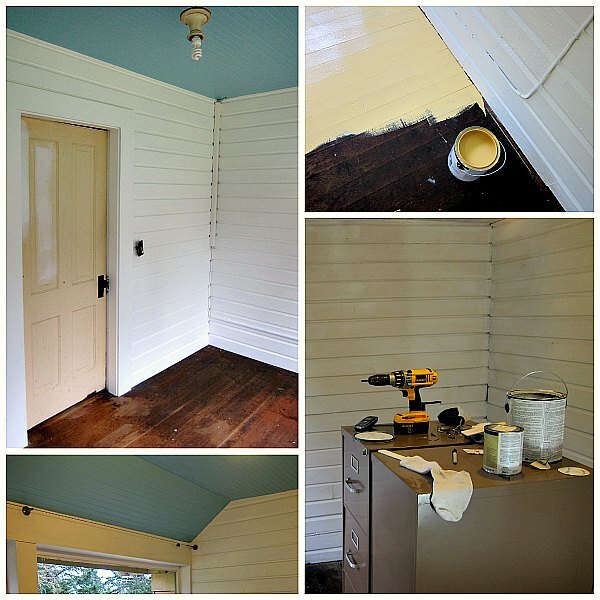 Painting the porch ceiling blue is an old Southern tradition and it was a sleep porch in its previous life so that was a very good idea. 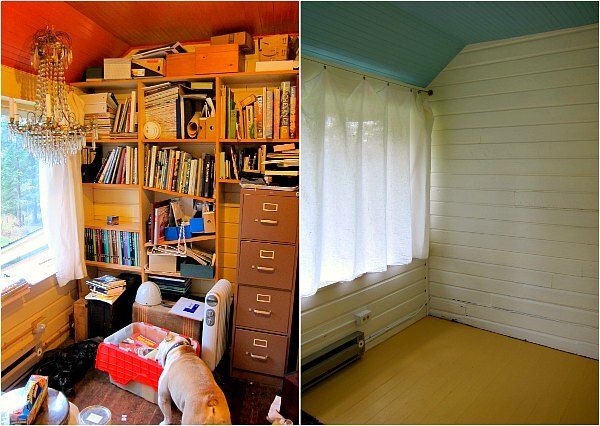 I saw lots of empty wall space for bookcases. Enjoy the new space. What a terrific job you’ve done. I’m sure the paper shuffle will continue-but eventually that stuff will find a home. In the meantime , you’ve created a wonderful space. Enjoy! Thanks Sue, appreciate the kudos. Now to just keep it clean and uncluttered. The room is wonderful! (as is your entire house, as far as I can see). It is such a great feeling after attacking a long-neglected space (and I know what I’m talking about!). I could spend hours at that little table with my laptop. Thanks Eileen, I’m really liking the space, but I do need to move a couple dog beds into the room. It seems Boz and Gracie snore at seisimic levels when not cushioned from a hardwood floor. I too have finally decided that my college textbooks need to live somewhere else. I think we believe that they keep us close to some of the great years of our lives. Might still have a bookcase or two in the back building if you’re interested? Blond wood-style, very Ikea-ish. Drop by any day after 3:30. Looks good, by the by, so does the garden. Hey Mr. Bean, Thanks for the offer! I may just take you up on it, if I fail to dispense with some boxes of books. As for the bees, unfortunately, neither hive made it through the winter. Each hive had honey, so the mystery of their demise continues. Tom, it’s been too long. I love the new office, and I’m super impressed by the floor paint. I wish you many happy hours drinking coffee, looking out the window and doing a bit of writing in your new space. It’s really a beautiful room. It has been too long Renae, hope all is well in your world. I’m excited about the prospect of actually having a room to write in, though I am currently distracted by a flush of robins lighting up the trees. Hey Tom ! The room looks great ! Thanks Brooks, and as for the bees, I’m hoping a wild swarm will find this already set-up digs. It has happened before, the scout bees finds some residual honey, and pass the word along when the hive splits. Here’s to a summer of bees and figs, Brooks. Diane, you’re safe, that will take a decade or so; plus, the sun and warming days will move me out of the house and into the fields and gardens for the next six months. Tom – I love your new office! Fresh paint works wonders that is for sure. I hear you about the baby steps…our garage is a nightmare! I agree. 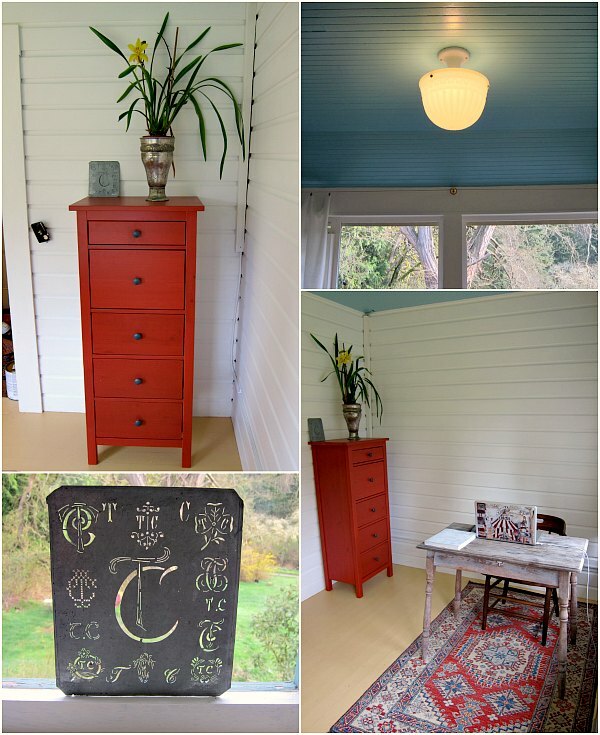 I simply painted my basement guest room in some fetching colours and it made a world of difference. I am happy to have over night guests now. Looks good. I’d say you’ve done a fine job. The tossing is the hardest. I look at my bookshelves crammed with cookbooks and cringe. When my mother died, I took her hundreds of cookbooks and put them in the trunk of my car, offering them to one and all as I went about my life. Now I’m thinking about what MY kids are going to do with all my cookbooks!! How to sort? Baby steps indeed. Tom, you did a great job here man. That “magic carpet” sure captured my attention. you’ve done a lovely deed — you gave hope to your house, that all it has held or will ever hold, is loved, cherished — honored with every brushstroke, every penned word. What more can a house want ? But its need to be a home. . . You and Buddy, and all your loved ones, friends, growing things — define that graciously. 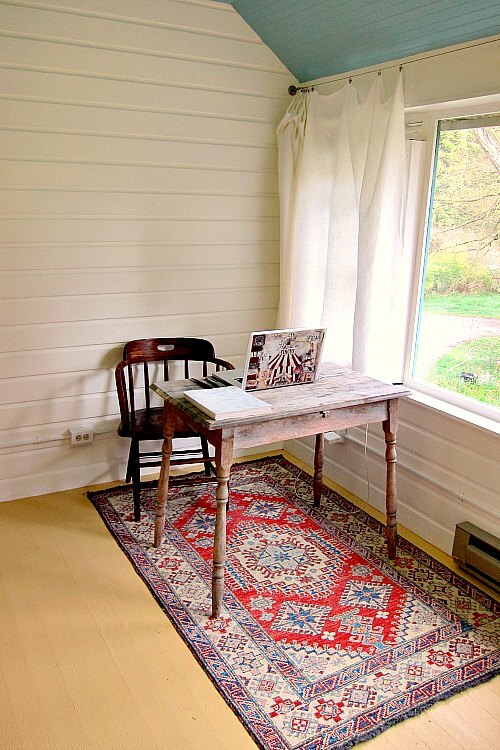 Home.. a desk, a chair, a rug and ~~thou!